Before we start with the typical What’s Up Wednesday questions, I want to give you an update on Holt. If you follow me on social media, then you hopefully saw my posts about this precious boy earlier this week. Holt is my cousin Alden’s son (he’s 3 years old), and he’s dealing with some unknown medical issues right now. I reached out asking for prayers, and my goodness did y’all show up in a big way. I love y’all for that. Holt has been dealing with various issues since the beginning of this year. In February he was actually diagnosed with Retinoblastoma (a rare eye cancer), but after heading to Philadelphia to meet with various specialists, they determined that he did not have Retinoblastoma! Thank you, God! At that time he was diagnosed with Scleritis and given medicine to control all issues associated with that. He returned home and was doing well, and then he recently begain experiencing some pain and swelling in his cheek. He headed back to his doctors last week, and after lots of tests, MRIs, and scans, they still didn’t know what they were dealing with. They biopsied the mass on Monday (thank you for all of the prayers! ), and that went as well as they could hope for. And now it’s a waiting game as we anxiously await the pathology results. 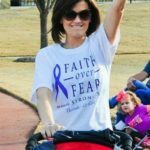 Alden updates their CaringBridge site with medical news and prayer requests, so I would love if you would follow along there. We want as many people praying for Holt as possible! You can also follow her on instagram, her handle is @pricealden. From the bottom of my heart, thank you for the prayers. Sweet Holt believes in Jesus with his whole heart, and the family’s faith is what is getting them through this incredibly difficult time. I mean, seriously. Look how precious he is. 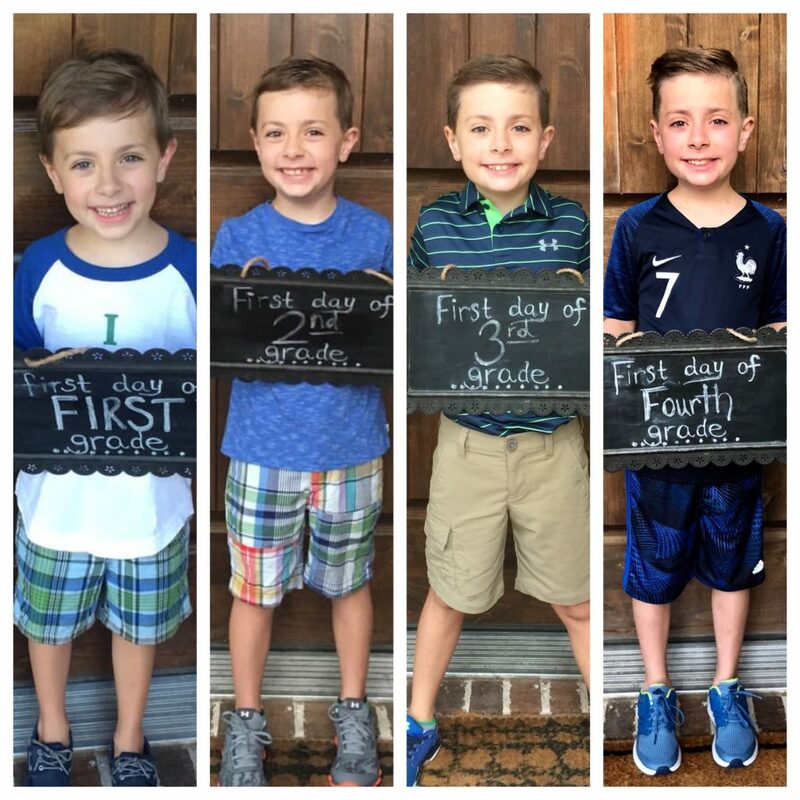 Carter started 4th grade last week! I took a walk down memory lane, and the collage makes me want to bawl my head off. He’s lost his baby face, which is terrible….but I do love his little man face too. I’m also mourning the time when he let me dress him every day! I mean, 1st grade was madras shorts, a graphic tee, and Sperry’s!!!! This year was a soccer jersey and athletic shorts. Remember this throw we all bought during the Anniversary Sale? WELL. It’s become quite the hot commodity in my house, and we’ve only got 1 kid! We’ve got throws scattered all around the house, but it’s this one that we all want all the time. It’s just so incredibly soft and warm! And I also love how it looks thrown over the couch when nobody is using it. It’s so plush, and I love the fringe! I’ve received no less than 100 messages from y’all thanking me for recommending this throw, so I definitely thought it was worth mentioning again. At $39.50 it’s a phenomenal price and makes an awesome gift. Mine is “pink brick” and the above picture is a better representation of the color than the pic below (where the sunlight seems to be making it appear lighter than it actually is). Click HERE for the throw. It comes in 18 total colors! Y’all know that I am a devoted user of Colleen Rothschild skincare products. In fact, for almost 2 years now her products are the only skincare products I’ve used, and my skin loves them. However, after hearing about this particular product from so many other bloggers, I decided to try it for myself, even though it meant branching out to another brand! GIRLS. 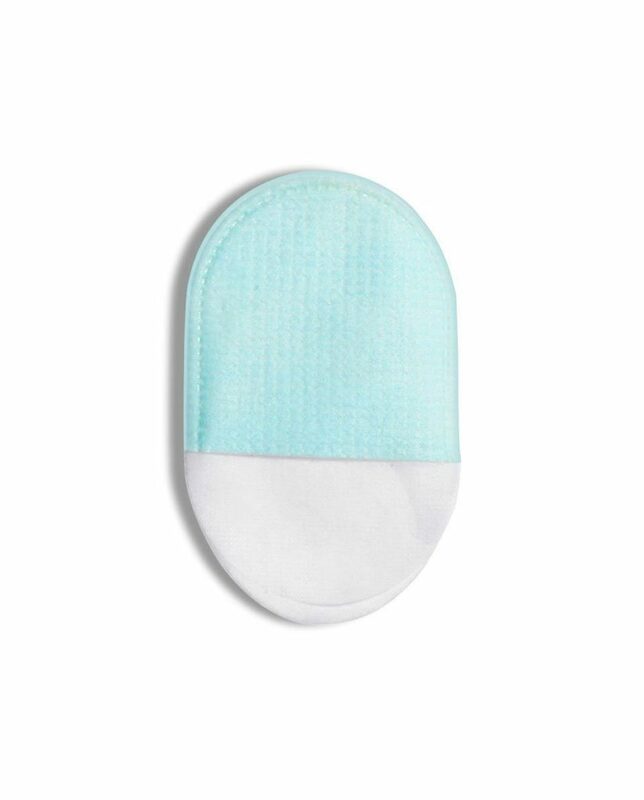 I’m totally digging these skin reviving treatment pads. I’ve used them twice a week for the last two weeks, and my skin immediately feels smoother and looks brighter after using them. You rub the serum all over your face with the white side, and then you gently exfoliate your face with the blue side. I get excited to use them because I love the brighter skin they reveal and my face feels incredibly clean after using them. I’m telling you, my face has never felt so fresh! I’ve also loved all of the comments on social media about Soma. CLEARLY, WE ARE FANS. And I have HUGE NEWS! Several readers commented yesterday that they found a code that got them 20% OFF their Soma purchase! I tried it, and it worked! Use the code 71533 for 20% OFF your order! You can even use it in conjunction with the BUY 3, GET 2 FREE vanishing line undies promotion right now! 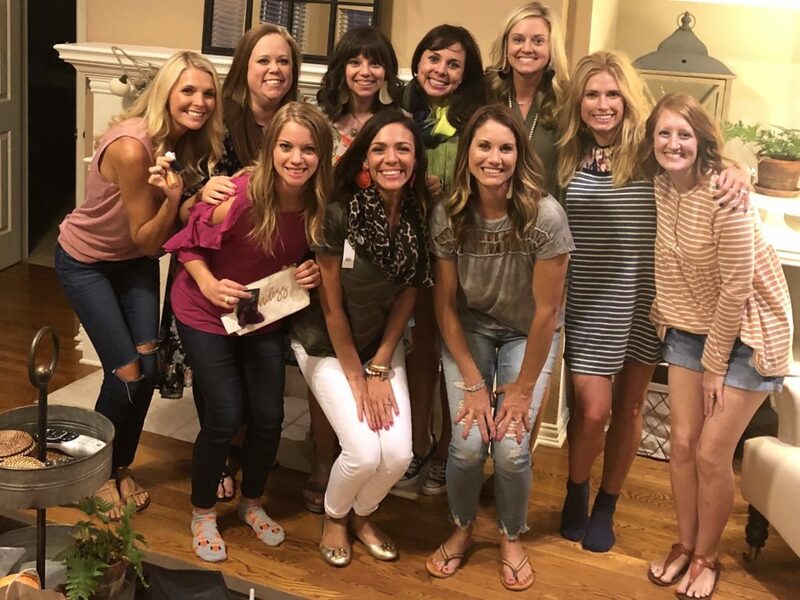 Last night was my girls annual scarf exchange….now a fall accessory exchange…and my goodness did we laugh a lot. It’s one of my favorite nights of the year with my favorite girls. This year a couple of girls got savage when it came time to steal the accessory they wanted, and it was HYSTERICAL. We missed our sweet friend like we always do, but she remains in our hearts always. Love you, Manda. Chris is heading to the ranch this weekend with friends, and Carter and I are staying here and hosting some company! Carter is pumped because Carson (the cousin you always see with us at the ranch) and his mom are coming to hang with us. We’ll spend time in the pool, but we are also heading to Pin Stack with the boys. I’m thinking we will be there like 1/2 a day letting them bowl, play video games, and maybe even some laser tag! My friend Shay talked about a product a couple of months ago, and she convinced me I needed to try it. Y’all. This product is freaking amazing. It’s called Tom and Sherry’s Wrinkle Spray, and I’m telling you, it will CHANGE YOUR LIFE. I mean, unless you love ironing. If you love ironing, CARRY ON. If you don’t, listen up! Here’s what you do. 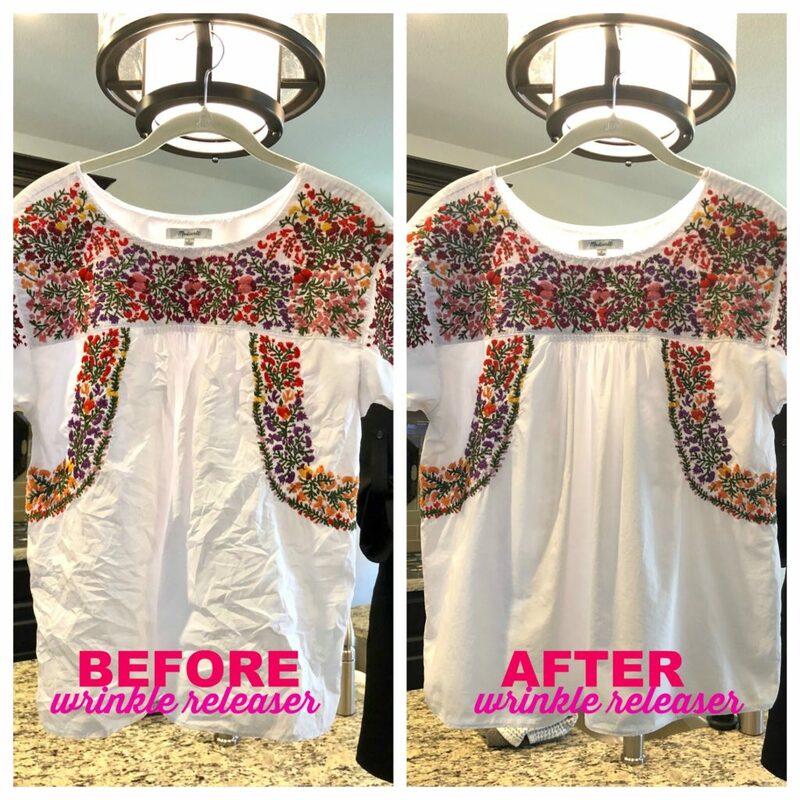 Hang up your wrinkled item, take several passes over it with the spray, and then let it dry. THE WRINKLES DISAPPEAR. Y’all. THEY DISAPPEAR. I knew it would work on knit shirts because I had seen Shay do it, but I was skeptical that it would work on this crisp cotton. This top is sooooooooooo hard to iron, and I don’t wear it as often as I would like, simply because I don’t want to iron it. And get this…you can use the code STMT10 for 10% OFF! LADIES! LOOK AT THOSE RESULTS! I mean, I may never pick up an iron again!!!! And in case you are worried about the ingredients list, the ingredients are non toxic, and the solution smells great too. And when thinking about travel, I will no longer have to carry my steamer out of town again. I’ll pop the little travel bottle in my suitcase, I’ll hang my clothes up and spray them upon arrival, and then they will be ready to go when I am! Click HERE for the spray, and remember to use the code STMT10 for 10% OFF your order! Nothing really right now! I’m just ready for the fall t.v. season to start! SOOOOO excited about This Is Us starting and the premier of A Million Little Things. As I’m writing this post, General Hospital is on in the background. What can I say? Old habits die hard. Y’all saw this dress (ONLY $39!) on me sometime last month, and I wore it again to church a couple of weeks ago. There’s only 50 left, but it will ship out immediately! I do wear this slip with it. I’m wearing a small in the dress. 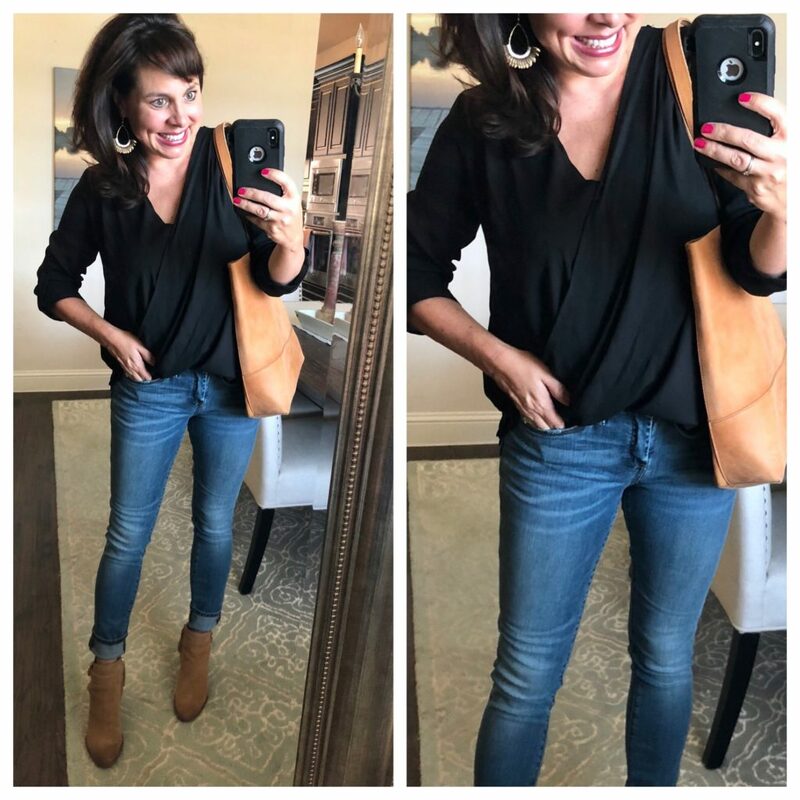 And just in case you want to see some other favorites from this retailer, I’m also digging these grey jeans for $46 and this olive tunic for $42 that looks PERFECT for both jeans and leggings. Make sure you use the code STMT10 for 10% OFF at The Find!!!! 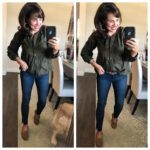 Last week on my post with eBay, I wore an olive green wrap top from a couple of years ago. I got LOTS of questions about where to buy the top, but it’s been sold out for over a year. 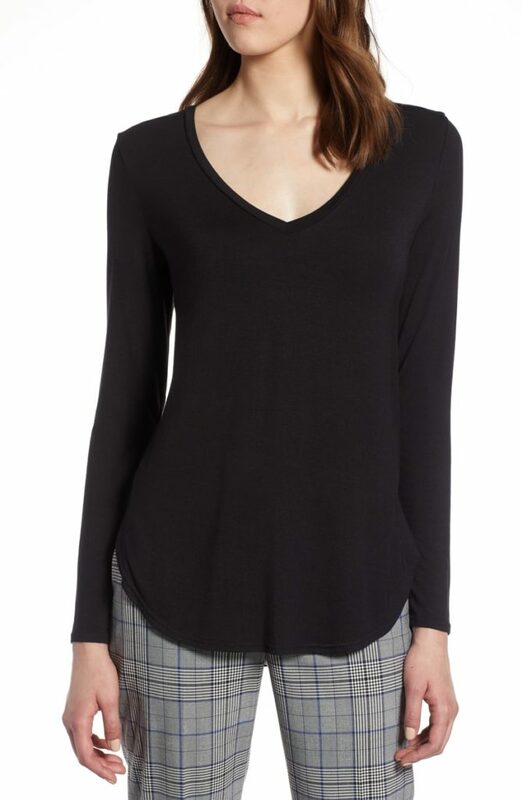 Luckily, I found the same style top in black, and it’s currently stocked in all sizes! You definitely have to wear a cami under this because of the neckline and the sheerness, but it’s a great top! I’m wearing a small in the top and a 27 in the jeans. If you loved the Blank NYC distressed denim from last year, these are the same jeans with no distressing! And here’s an outfit I wore yesterday doing errands around town. The camo tee is light weight and perfectly slouchy. In fact, it’s so slouchy you can even wear it a bit off one shoulder if you so desire. I’m wearing a small in the tee and a 27 in the shorts. And I’m OBSESSED with the earrings. You’ll be seeing them in Friday’s post too. And I just ordered this v neck tunic ON SALE for $19.49, so I’m going to be wearing it very soon! 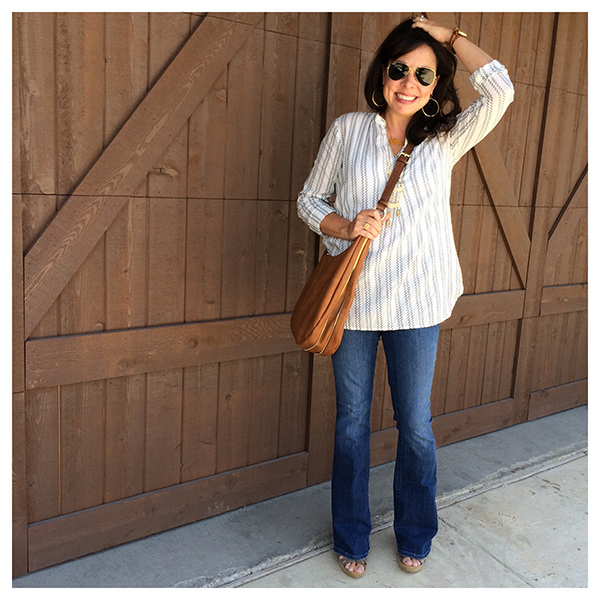 It has great reviews, looks like a perfect fall staple, and comes in several colors (including a stripe). 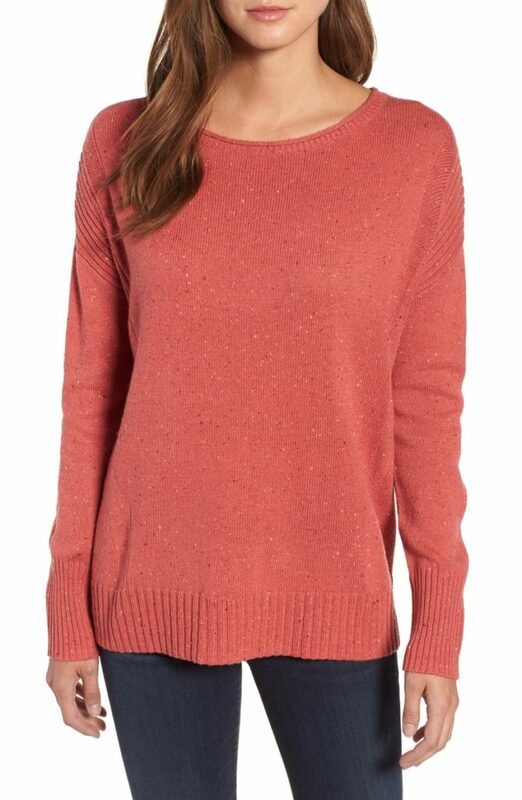 And how cute is this zip back sweater, also on SUPER SALE! It comes in several colors, but I love this warm spice color for fall. I’m constantly sharing things I love with y’all, and you know I love it when you share things you love with me as well. I received this tip on some super cute pants and thought you would want to know about them! 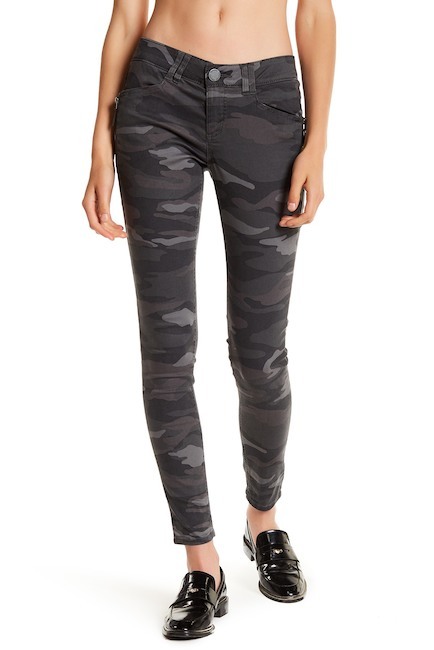 Click HERE for these camo skinnies! Ours is simple, but Carter’s absolutely favorite thing to eat is steak, so we always have a big steak dinner the first day of school. See y’all back here on Friday, and don’t forget to link up now! 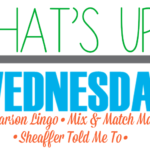 What’s Up Wednesday and a DEAL ALERT! oh, i’m sorry to hear about your cousin’s son. hope the results are good ones. he looks like such a sweet kid! i definitely need that throw! i mean, i have like 75 blankets in my house and i’m the only one who uses them.. but i need it. 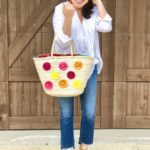 the fall accessory exchange is such a great idea! i despise ironing so yes, need that wrinkle spray. Sweet Holt! 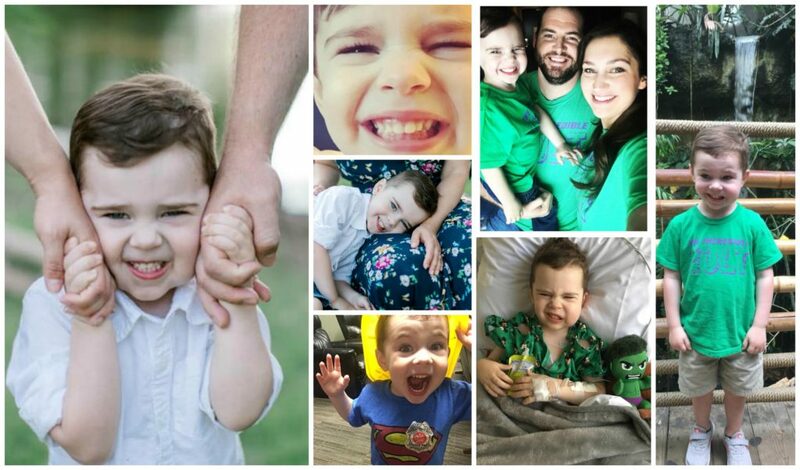 I cannot stop thinking about him and his parents. Praying so much, Sheaffer!! Those Pegasus earrings are adorable. They go with everything and are so cute!! 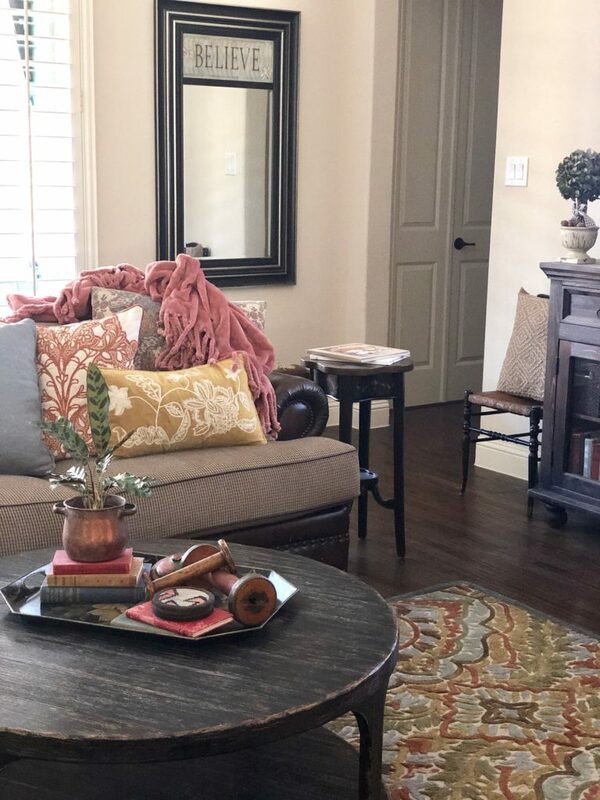 Your post about the plush throw includes a pic that highlights your beautiful area rug. Can you share the details of the rug? Thank you for the update on Holt…continued prayers for him and his family. On another note I also love Colleen Rothchilds skin care line but those Tula pads are amazing!!! Just got my bottle of wrinkle release, haven’t had a chance to use it yet but I am seriously impressed with your top. Big prayers for Holt and his family!! Going to check out that camo top right now!! I think I NEED that wrinkle spray! I do fine at home but when we travel my clothes are always a mess. 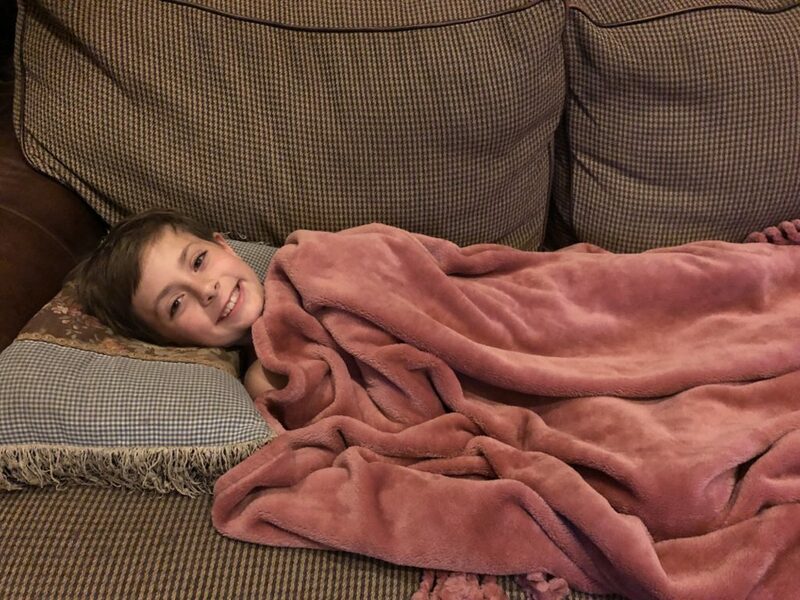 That throw blanket looks nice and soft too… and I know i’d battling with my kids over who gets to use it. Hi, Alexis! I do pull on them! Works like a charm for me. So sorry I don’t have any tips or tricks, it literally just works like magic for me! Maybe you aren’t spraying enough on? Girl, I bought 3 bottles of wrinkle spray, based on that white top! (1 for me, 2 for my girls.) Here’s hoping it works as well for us! You will LOVE IT, Jill! what size zip back sweater did you get? it says it runs big…hmmm Love the warm spice color too.